Here I am playing peek-a-boo I hide my nose with my paws and pretend no one can see me. I look so cute, my master can't resist coming over and giving me a tummy rub! 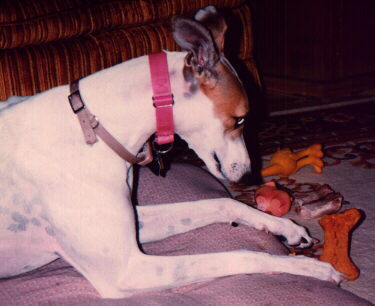 I can't decide whether to play with my pink pig or my rubber chicken. Maybe I'll just eat that dog biscuit. I am a very curious doggie. I poke my nose into everything - the clothes hamper, empty bags and boxes and like to push my master's dolls in her collection around. I never really hurt anything, just push things around to suit myself. 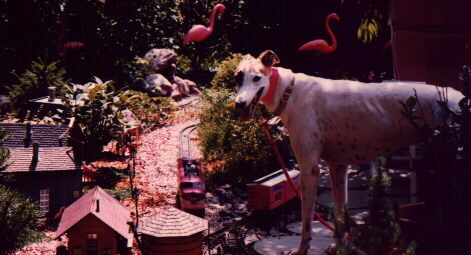 Here I am checking out my master's garden railroad. I don't like these little trains very much. They make me nervous. I do some weird things sometimes. I don't like tile floors. They make my feet slip, so my master had to put a carpet runner in the kitchen, before I would walk in there. When she takes me to the vet once per year for my check-up, I won't walk on the floor, so they have to lay towels down for me to walk on or carry me in. I never have a problem walking out, though. I think I just do this for the attention! My favorite time of day - breakfast, lunch or dinner! If I put my nose on the table and stare at the food, my master usually will give me something. Then I always get to lick the plate when she is done, (so she doesn't have to put it in the dishwasher - ha. ha. Some of my favorite foods are milk, ice cream, grapes, broccoli, cauliflower (I love my veggies) I also have to eat dog food and I do, once a day, and I get lots of Milk Bone dog biscuits. 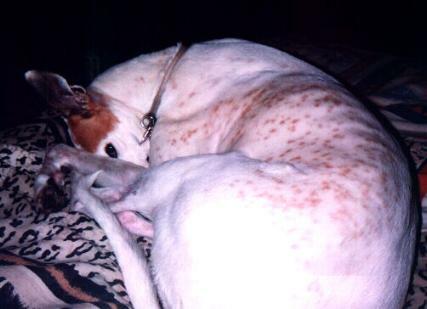 Here I am in one of my favorite places, in my masters bed with my paws on her pillow. The best part is when she gets up and I get the whole bed to myself all day. I'm such a lucky dog.